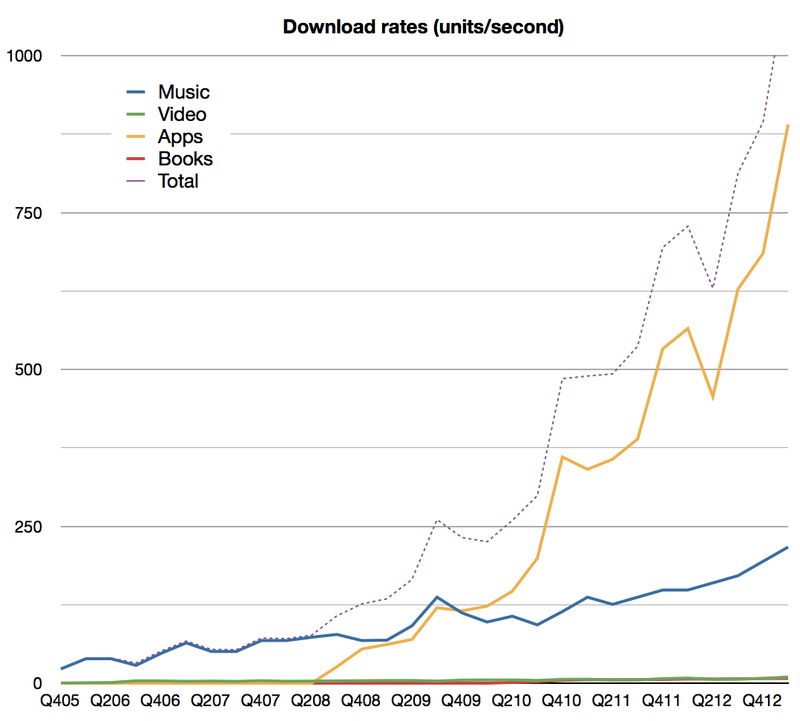 iTunes users spending at the rate of $40/yr. Quarterly revenues topped $4 billion (a new high) and the company suggests that this rate is maintainable by stating it has a “$16 billion annual run rate”. The pattern of revenues is shown below. 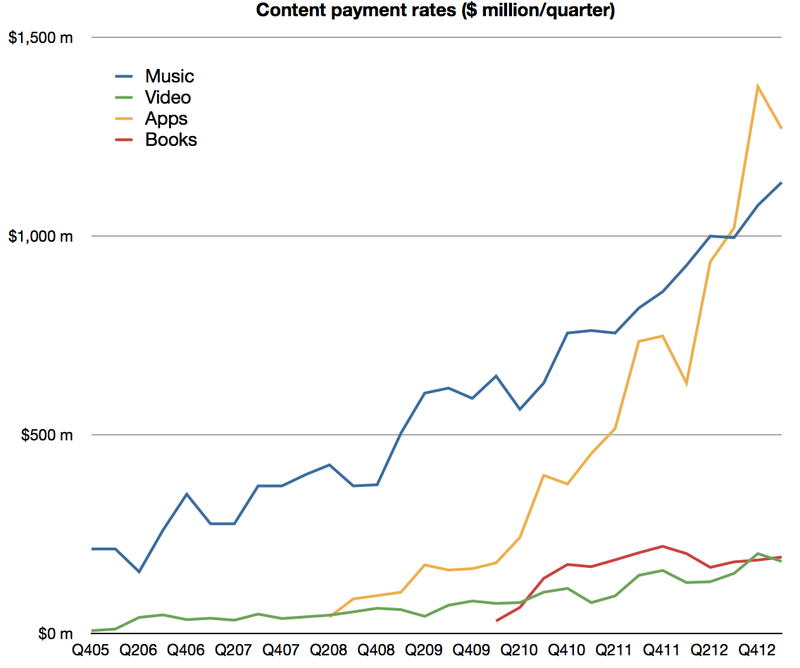 The content portion of iTunes revenues was $2.4 billion, up from $2.1 billion sequentially. 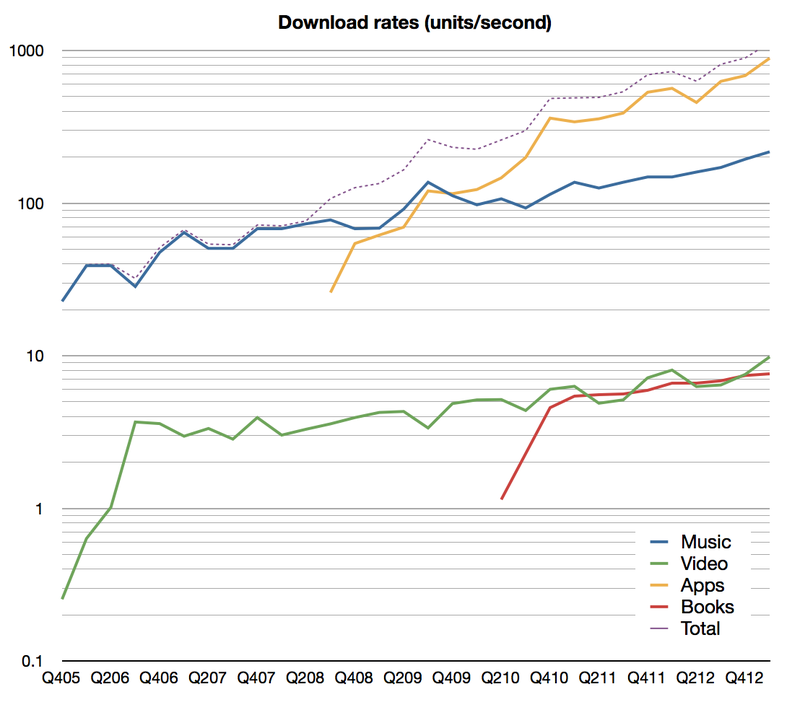 Growth into Q1 is not unusual as many holiday iTunes gift cards are redeemed during January. Revenue growth has been surprisingly steady, averaging 29%/quarter for more than six years. Music is now available in 119 countries. 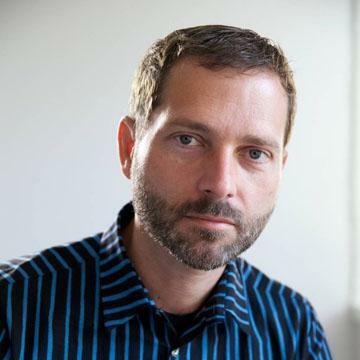 The Music catalog now consists of 35 million songs. Movies are available in 109 countries. 60,000 titles are offered. 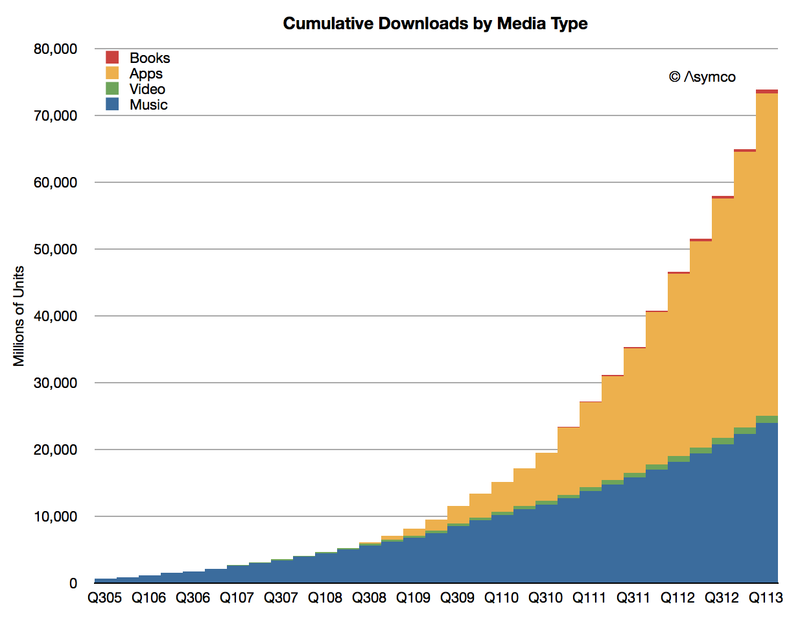 iBookstores are present in 155 countries offering 1.75 million iBooks. There are iTunes App Stores in 155 countries whose residents make up about 90% of the world’s population. iOS developers have created more than 850,000 iOS apps, including 350,000 made for the iPad. Cumulative app downloads have surpassed 45 billion and are on track to reach 50 billion at time of writing (estimated to be reached mid May). 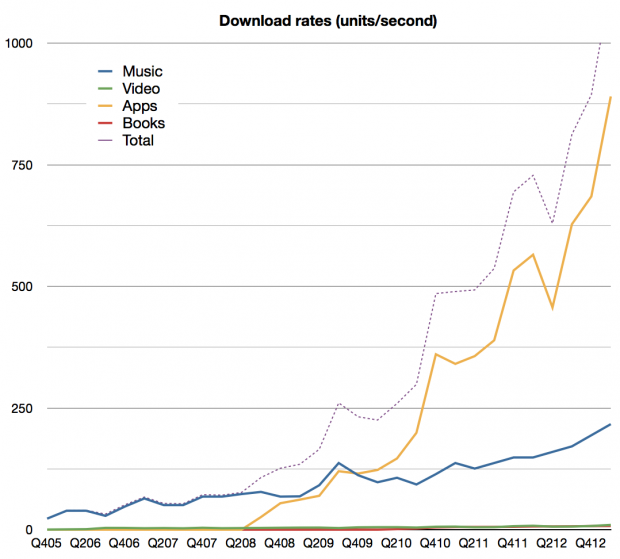 Canalys estimates that sales from iTunes App Store accounted for 74% of all app sales worldwide in the March quarter. 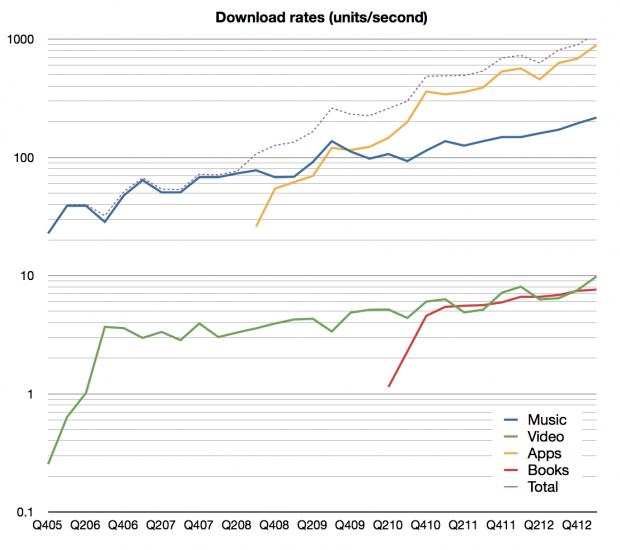 iOS app revenues more than doubled year-over-year. 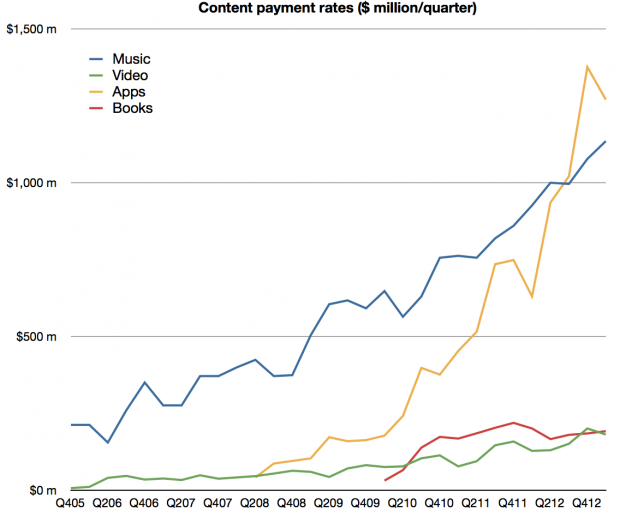 Including all (gross) content revenues, the sales rate is now nearly $5 billion per quarter ($4.94 billion). 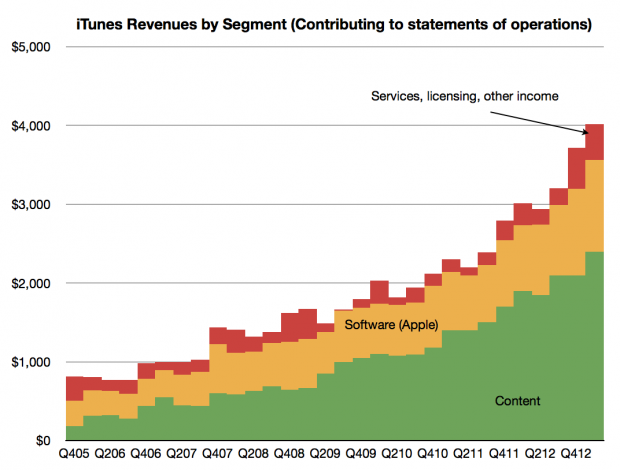 Including services, the iTunes consolidated business cleared over $5.5 billion. In March Apple reported that they have 500 million iTunes so one way to think about the iTunes business is to say that iTunes users purchase content and services at the rate of about $40 per year. “For third-party applications sold through the App Store and Mac App Store and certain digital content sold through the iTunes Store, the Company does not determine the selling price of the products and is not the primary obligor to the customer. Therefore, the Company accounts for such sales on a net basis by recognizing in net sales only the commission it retains from each sale. The portion of the gross amount billed to customers that is remitted by the Company to third-party app developers and certain digital content owners is not reflected in the Company’s Consolidated Statements of Operations.” From Apple SEC filing 10-K, October 2012.